Wouldn't there be a way to customize the "answer" box so that there is a warning about standard loopholes? That body of text doesn't make a lot of sense for PPCG. But it turns out that it can be customised for each site. This is the perfect place to point to loopholes and similar things, so let's rewrite this. I have drafted a new version here, which is probably still far from perfect. Thanks for contributing an answer to Programming Puzzles & Code Golf Stack Exchange! Please be sure to follow the challenge specification. 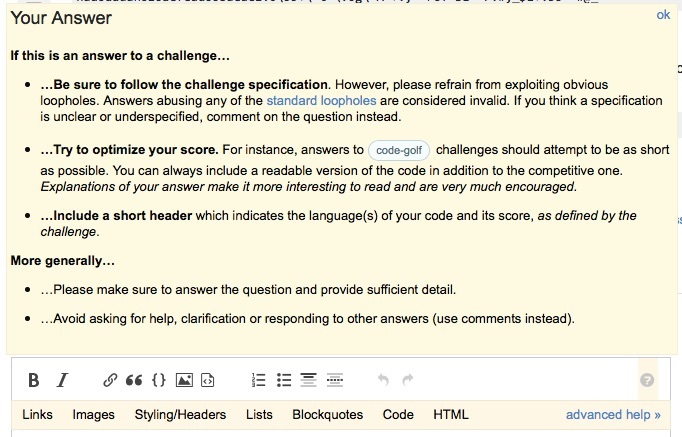 Include a short header which indicates the language(s) of your code and the score as defined by the challenge. Explanations of your answer are very much encouraged. All answers should show some effort towards reaching a better score. For instance, answers to code golf challenges should try to be as short as possible (within the constraints of the chosen language). You can always include a readable version of the code in addition to the competitive one. Don't try to answer a challenge by exploiting loopholes in the specification. Answers abusing any of the standard loopholes are considered invalid. Please make sure to answer the question and provide sufficient detail. This is quite long, so please help me edit it down a bit. Post feedback (corrections, additions etc.) in the comments and answers. I am evidently sold on the idea. Here is a modified version in order to bring more thoughts on this. Be sure to follow the challenge specification. However, please refrain from exploiting obvious loopholes. Answers abusing any of the standard loopholes are considered invalid. If you think a specification is unclear or underspecified, comment on the question instead. Try to optimize your score. For instance, answers to code-golf challenges should attempt to be as short as possible. You can always include a readable version of the code in addition to the competitive one. Explanations of your answer make it more interesting to read and are very much encouraged. Include a short header which indicates the language(s) of your code and its score, as defined by the challenge. Avoid asking for help, clarification or responding to other answers (use comments instead). Here's a sightly condensed version. Using nested lists takes up less space, and the title can be merged with the first paragraph. Thanks for contributing to Programming Puzzles & Code Golf Stack Exchange! Add a header indicating the language(s) of your code and the score as defined by the challenge. Not the answer you're looking for? Browse other questions tagged discussion feature-request status-completed answers new-users . Should Standard loopholes apply for all questions? Can the “How to Answer” pop-up disregard the association bonus? Can we make our answers more useful? Does fixing an implementation bug renders the answer non-competing? Can serious contenders do more than the challenge asks for?